Large format photography is the art of static photography, it claims you maximum concentration and it takes time to take a photo. That’s what I heard from my developer. So nothing for street portraits huh? I just love challenges and I love to slow down, take time again and breathe. That was the reason I started with my Mamiya and medium format photography. A good friend started to talk about large format photography, he showed me lots of landscape pictures and some great macro shots he did in the studio. And guess what I saw in my mind, I saw great portraits of people on the streets. I’m shooting mostly in manual mode, due to my experience I know the settings pretty well and for the rest I look at the exposure scale in my viewfinder. After a shot I can check the photo on the screen and do another one, if I’m not happy with the result. Choosing the right film for the shoot, setting aperture and shutter speed. Looking through the viewfinder and half press the button to start exposure metering. In difficult lightning situation I meter different positions and calculate myself an average shutter speed (or the one that meets my main subject in the picture). Looking again thru the viewfinder and manually focus (mostly body focus), than waiting for the perfect moment and click, done. Setting up the Tripod, unfolding the camera and setting up the lens, choosing the right position for the lens that meets the right framing for the portrait (distance). Calculating the exposure compensation because of the lens position. Setting up the person in front of the camera, changing the position with the tripod. Measuring the exposure with either a digital camera or with my Seconic. Applying the settings to the lens. Putting the “coat” on and start to do the exact framing (from now the person should not move anymore). After I’m happy with it, I start to use the magnifier to focus accurately. If I’m finished with that (the person should still not move), I close the aperture (don’t forget that, otherwise the film is ruined) and put the film cassette in, remove the protecting slide (Person must still stand on the same place, it’s very important, because I shoot still wide open here) and then I’m standing beside the camera and wait for the perfect moment to press the shutter button. And at this moment I really wait, because I have only one shot. 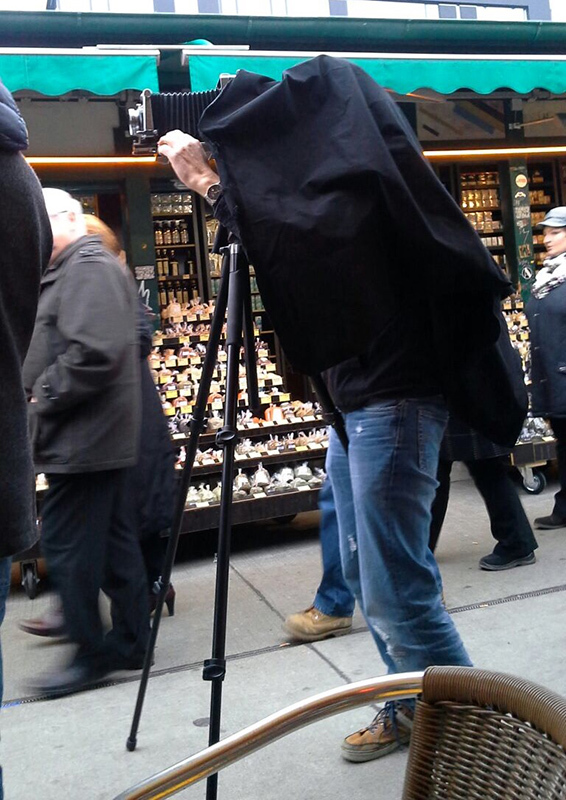 And now imagine the difference in shooting street portraits with this three cameras. With the digital and analog medium format camera, I just can walk around with them in my rucksack and trust my feelings to talk to the right people. If I found someone, I get the cam out of my bag and in maybe 1 minutes I’m done. I guess you can imagine, that this is different with the large format camera, even if I found somebody, I have to prepare them that they have to have patience. And if I really ask somebody to take their picture, I really want to have one of them. If you have seen my portraits already, you see that I always look for characters and for special people that are different. Now imagine what is in my mind if I found such a person. I really want to have their picture. As you read above, with the large format, I have to do a lot of preparation and get only one shot. Maybe you can now imagine how exciting this is for me. And then there is the waiting for the development. I only did two sessions with the Linhof right now. So is it tougher to get street portraits with it? I arrived, this is the right thing for me. Going back to “real” photography, slowing down and finding people who are willing to do so too.This slowing down process gives the subject and me a totally new chance to capture a naturally photograph (because there is now way he is standing there and do a fake smile for that long). People are getting relaxed and interested watching me doing the preparation. Definitely the camera type can change the peoples expression. I also like the thing, that I’m standing beside the camera when pressing the shutter button. It’s like I can watch myself taking the picture. You gotta carry a lot of heavy stuff with you (You better work out in your free time) and every shot is very expensive. A fascinating insight into a foreign world for me. I’m firmly in the digital camp though I have been eyeing up a few film 35mm SLRs on eBay recently. But the large format process sounds fascinating and I really enjoyed the BHTS shots. Colin, you are welcome and thanks for your feedback. It’s really fascinating and also very satisfying to work more with your own hands again to get the job done.